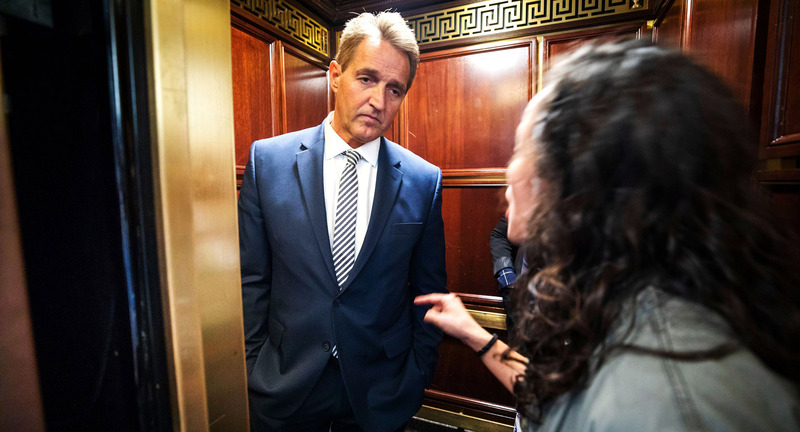 When two women survivors of sexual abuse confront a Senator in an elevator to dissuade him from confirming a Supreme Court nomination hanging on the precipice: that is the raw hope of humanity rising. This bold assertion of civic duty and act of conscious at the House of Congress to challenge unfair authority is the kind of powerful defense of democracy that gives raw hope to what remains of a rapidly deteriorating political system. When the United States Senate Judicial Committee is about to confirm a Justice accused of sexual violence without providing due process to the victim, this is a direct assault against every woman in the country, particular those survivors, like Ana Maria Archila and Maria Gallagher, who may never again have faith in the judiciary search for truth. Yet, when two women can insert themselves into the narrative of this confirmation that is tearing America apart, we sense, we feel, and we know: there is still a small ray of raw hope of humanity rising. This hope is as raw as our democracy is faltering, as our basic political and economic rights are faltering, as the environment is faltering, as inner cities and roads and bridges are faltering, faltering from neglect and from the misdirection of priorities and oversight. Instead of taking care of the people, we see the proliferation of fear and division, we see hatred on the rise, we see digression into tribal rivalry, we see selfishness and greed, we see the abuse of power, we see the abandonment of what serves the common good. So when we see two tearful, passionate women confront a Senator in an elevator, we know that despite all the faltering, all the abuse, all the fear and hatred, all the unfairness, the darkness… there is still light, a ray of light illuminating raw hope, and we must cling to that hope, at all cost, otherwise we have nothing. Once the hope is gone, nothing is left of humanity. In its stead, we will exist in a state of emptiness, a void, a world without truth, everyone for themselves, a deeper plunge into tribalism, of fear, desperation: TRUMP’s world. The only defense in a faltering political and social environment is belief in the raw hope of humanity rising, however small, because each and every act of determined hope is an illumination in the darkness. Only in this act, the fundamental exercise of the human spirit, will we keep humanity alive. That is the raw hope.